Progressive slots are brilliant and the casino at BetVictor has loads of them. One of the most famous progressive jackpot slots of them all is Mega Moolah and you can play that at BetVictor. This online slot has perhaps made more millionaires than any other. As well as being loads of fun and very simple to play, this slot could change your life. If you’re looking for an online casino site that A) has Mega Moolah and B) has a great welcome bonus, BetVictor is the one! Click the button below to join BetVictor. Or you can read more about the 200% welcome offer up to £200 that also includes 200 free spins! If you already have an account at BetVictor Casino, read on for more info on Mega Moolah itself. 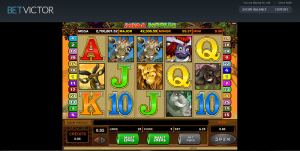 Mega Moolah is an amazing slot and you can play it at BetVictor Casino. It’s available on the main online site and also on mobile. It’s a five reel game with 25 lines and it offers four progressive jackpots. There is the Mini, the Minor, the Major and, of course, the Mega. For many players, Mega Moolah is all about the Mega progressive jackpot, however, there is much more to this slot than just that. The free spins bonus round is triggered by landing three or more Monkey symbols. This will earn you a tidy 15 free spins, with wins TRIPLED! That can lead to some monster wins, especially if you’re initial coin value was high. A further 15 free spins can be triggered during the bonus round if you get another three Monkeys. King of the jungle, the Lion, is the Mega Moolah wild. The Lion symbol also doubles any wins that use it. Note that the Lion doesn’t substitute for a Monkey. To win any of the four progressives in Mega Moolah you just have to play! All four, including the Mega, are triggered randomly. The higher your bet, however, the greater your odds of winning the big one! The top prize starts at £1m, with the Major starting at £10,000, the Minor at £100 and the Mini at £10. Whilst those are the starting points, they can go MUCH higher. The biggest ever win on Mega Moolah was a staggering £13.2m! Indeed there have been loads of wins of more than £5m. That’s life-changing cash and you can win with even a small stakes spin. With BetVictor’s 200% welcome bonus effectively tripling your cash straight away, why not join and see if your luck’s in? You don’t have to max out the full £200 bonus so whether you’re new to online casinos or a high roller, claim your 200% offer now! That Mega Moolah could be yours at BetVictor Casino!